six decades. His intersection with the 1980s was brief, but I honestly can say I watched him play – maybe not in his prime – but actually play a meaningful game in the National Hockey League. That intersection of history not only represents what Howe was as a player, but also represents a unique time in the history of the game. I was thinking about these things when I heard Gordie Howe had passed away at the age of 88. The legend of Gordie Howe is well known. He was an all-star, leader, Stanley Cup champion, and the most dominant force in the National Hockey League when he played with the Detroit Red Wings, starting in 1946. By the time he retired, he was the league’s all-time leading scorer, and considered by most the greatest player of all time. What just increased his stature, and legend, was when he came out of retirement to play with his sons Mark and Marty for the Houston Aeros in the fledgling World Hockey Association. His arrival, along with another legend in Bobby Hull, gave the league instant credibility. He played four seasons, from 1973 to 1977, with the Houstone Aeros, leading them to consecutive WHA AVCO Cup championships in 1973-1974 and 1974-1975. All three of the Howes would join the New England Whalers in 1977 and play two seasons there, 1977-1978 and 1978-1979. Instead of being just another pretender, the World Hockey Association was enough of a contender for fans of the game that it precipitated a merger with the National Hockey League. The Edmonton Oilers, New England Whalers now renamed the Hartford Whalers, Quebec Nordiques, and Winnipeg Jets would be joining the NHL while the rest of the players would be dispersed. Gordie Howe, and his sons Mark and Marty, were allowed to stay with the Whalers. Gordie Howe would be returning to the NHL. Given that I had never seen a WHA game, I really did not understand the true impact of the merger until much later. It meant, for the most part, that more teams meant more hockey cards. The other thing I did notice, was how the New England Whalers of the WHA, and their logo and uniforms, were transformed into the Hartford Whalers of the NHL. The first time I saw both the old jerseys and the new ones was in reading the “Hockey News” by Scotiabank. 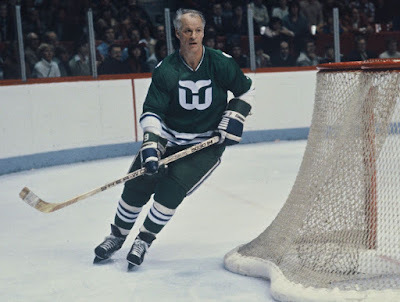 Gordie Howe, at age 51, would play one more season in the NHL, that landmark 1979-1980 year with the four new teams, expanding the league to 21 teams. One of his teammates, another legend returning to the NHL was Dave Keon, who had starred with the Toronto Maple Leafs before going to the WHA. It was a landmark season for several years. Howe, who would turn 52 during the season, played in all 80 games that season notching 15 goals and 26 assists for 41 points. The all-star game that season was in Detroit, site of so much of Howe’s glory, and coach Scotty Bowman chose Howe to play in the game. It would make five decades of all-star games Howe played in. This was extra special. In addition to it being in his fifth decade and Howe being in his 50s, he would play with the second youngest all-star in history, 19-year-old Wayne Gretzky. Howe twice got a standing ovation at that game at the Joe Louis Arena. For good measure, Howe earned an assist in the Wales Conference’s 6-3 win. Another highlight was that late in the season the Whalers acquired Bobby Hull, so Hull, Howe and Keon, three legends, played on the same line in the NHL. The Whalers finished with 27 wins, 34 losses and 19 ties for 73 points, good enough for fourth in the Norris Division, and the best record among the four former WHA teams. They qualified for the playoffs, facing the mighty Montreal Canadiens in a first-round, best-of-five series. The first two games were in Montreal. The Canadiens won Game 1 by a score of 6-1. The Canadiens led 4-0 part way through the second period of Game 2 when Howe and his son Marty set up Ray Neufeld for a goal to make it 4-1. Gordie Howe would score in the third period, but it was nowhere near enough to keep Hartford from losing 8-4. It was Gordie Howe’s final goal in the NHL. Two days later, Howe would play his final NHL game. It was in front of his home fans in Hartford, as the Whalers put up a valiant fight, taking the Habs to overtime before losing 4-3 on a game and series-winning goal by Yvan Lambert. With that, Gordie Howe skated off into the sunset. There really are not enough words to describe the remarkable career of Gordie Howe. Incredibly, most of his NHL glory occurred before I was born in 1970. However, he re-ignited his career in the World Hockey Association, where he won two championships and had the pleasure of playing with his two sons. Then, by a quirk of history, he was able to rejoin the NHL for one last season, where he was not only productive, but helped lead his team to the playoffs. It was that brief intersection with the 1980s, that I finally got to see Gordie Howe play. It was April 9, 1980, and I was staying over night at my Uncle Ed’s in Lethbridge. I was watching Game 2 of the Whalers-Canadiens series when my cousin wanted to watch something else. I went upstairs to the living room and watched the third period. My uncle was up there, dozing in front of the TV. I told him how excited I was to finally see Gordie Howe after all I had read about him. Suddenly, this Whaler's arms went in the air. Obviously Hartford had scored, but I could not see who. In fact, Gordie Howe had scored. The replay showed he beat goaltender Denis Herron with a long backhand shot. The Montreal fans gave him a standing ovation in response. I had finally seen him score a goal, and it was the last chance I ever had. It just showed that, at 52, playing against players half his age and more, that he was the ageless wonder.